Fold binding in half lengthwise & press. Then fold seam allowance of one of the edges & press. Pin & sew unfolded edge of binding to neckline. If you have an opening at the back neck, fold the ends of the binding inwards & press to secure in place. Finally from the right side stitch in the ditch (sink stitch) along the neck seam, making sure that inside bind edge is caught in the seam. The technique is exactly the same. All you’d need to do is to create a V-neck tuck in the centre neck. Fold binding in half lengthwise & press. Then fold seam allowance of one of the edges & press. 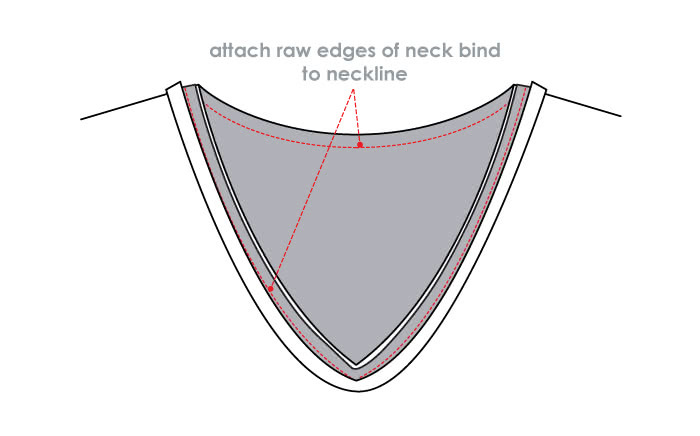 Sew edges of neck bind. Press open to reduce bulk. 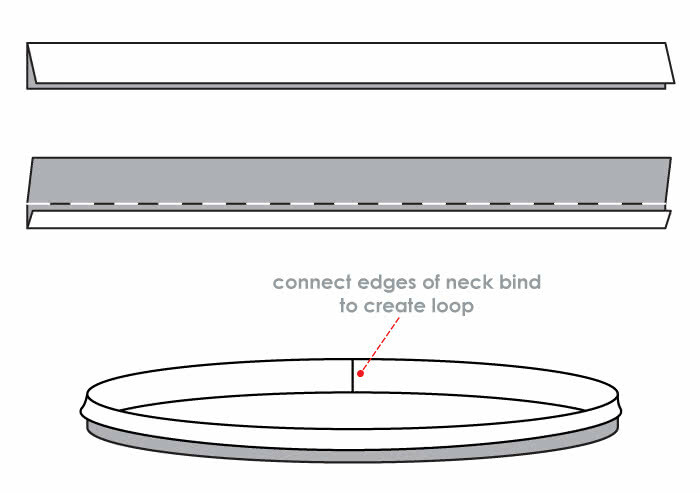 Attach unfolded edge of bind to neckline. Fold bind over the seams & pin in place. 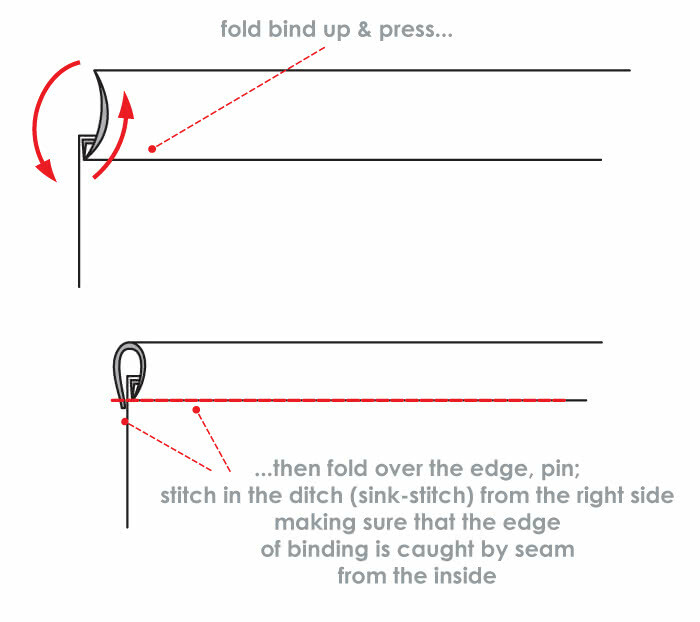 Stitch in the ditch (sink stitch) along the neck seam from right side, making sure that inside bind edge is caught in the seam. 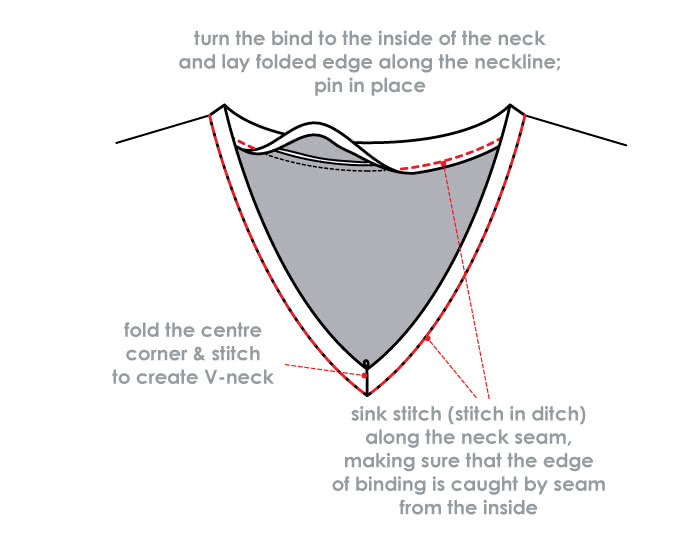 Fold the centre corner & stitch to create V-neck. This technique will help you to create accurate professional looking bound edge. This type of binding in perfect for necks & armholes. Lay raw edges of bind along the edge which you are binding. Pin in place & stitch together. Fold bind up & press neatly. Then fold bind over the seam & align over the stitching (make sure the edge of the bind is covering the stitching by about 2mm). Pin in place. Stitch in the ditch (sink stitch) along the seam from right side, making sure that inside bind edge is caught in the seam. Fold binding in half lengthwise and press. Stitch both raw edges of the binding together. Pin then stitch the raw edge seams of the binding to the neckline. Flat stitch the seam edge of the binding, then turn bind completely to the inside and pin in place. 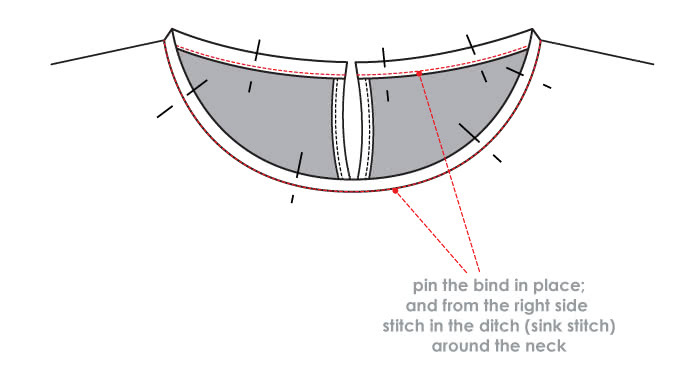 Hand stitch with a slip stitch on the inside or/ sew a ¼” or 6mm top stitch.